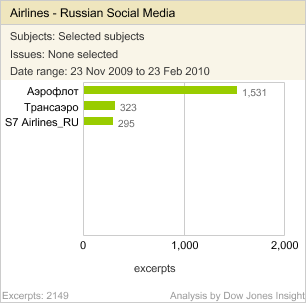 Can Aeroflot Use Social Media to Its Advantage? Aeroflot, the leading Russian airline, aims to become a top five airline in Europe by 2010, a challenging objective in the current turbulent times of the airline industry. Its management is fully aware that as competition is becoming more intense, they need to improve its image in order to win passengers in Europe. Last year, one of the first announcements by the newly appointed CEO was a tender for conducting a PR campaign to change the perception of Aeroflot as an old-style, unreliable company. Social media is playing an increasingly important role when people are making choices for travel, and so passengers sharing travel experiences in blogs and forums has become a challenge for the airline. 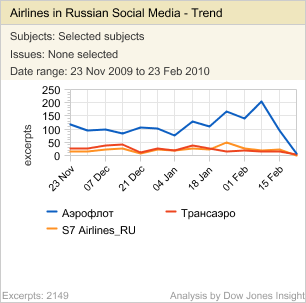 Based on a blog search using the Dow Jones Insight platform, we found that Aeroflot was mentioned in 1,526 hits over the past three months, compared to 323 blog hits for Transaero and 295 blog hits for S7 Airlines. For example, in late December 2009, a few Aeroflot flights with passengers going on their winter holidays were delayed. Dozens of complaints were posted on the net, with passengers highlighting problems that were later extensively reported in the traditional media. As the emotions ran high, the unhappy passengers also criticised in detail the new terminal building that Aeroflot was transferring its flights to and advised readers not to use the airline in the future. There was only one favourable comment from a passenger who was contacted by the Director of Communications after she posted information about lost luggage, while there were many negative comments about access to the new building by public transport, its infrastructure and poor services. So even before the official opening of Aeroflot’s new terminal promoted it as a world-class facility, the company received a painful blow to its reputation. The airline industry is probably one of the best examples of a business that cannot neglect social media. In the era of open communication, passengers are willing to share the information about their flight experiences and ask for advice. In 2009, S7 Airlines lost a court case to a blind passenger Pavel Obiukh who was not permitted to check in for the flight, because he did not have an accompanying passenger with him. A few months later, Russia’s Association of Disabled People launched an appeal on its forum calling on blind people to test the airlines and report of any cases of violation of their rights. Being alert to the social media is not a luxury but a necessity for an airline whose reputation is so dependent on the client’s experience. Aeroflot has to win passengers hearts and use social media as an vehicle to reach its objective.